Description: Older seedlings planted in a large plastic bucket referred to as KPN6. 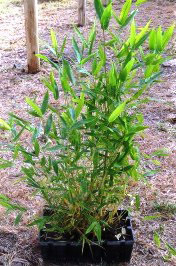 This type of seedling has a much more developed rhizome and the young stems measure up to 6 feet tall. We have seen many landscapers, and middle size plantation owners going for KPN6 to make an immediate impression.